Day 3 of the women's London Olympic Basketball tournament was opened with a game between France and Canada in front of almost a capacity crowd. The spectators in the stands appeared to have more energy than the players at the start of the game with plenty of "Mexican waves". After a slow start in the first half the match livened up during the second half with once again France being involved in a nail biting finish. 2 free throws by Céline Dumerc with 9.6 seconds left to play enabled the game to finish in regulation time with a victory for France (64-60). France and Canada are no strangers to each other. Over the last four years they have played each other in a number of test matches. However their last meeting took place during the Olympic Qualifying Tournament in Ankara for the London Olympic basketball event. France won that match (56-47) but found the going tough. So it came as no surprise that their latest match was a close affair. The most interesting statistic from the match is that neither team made a shot from beyond the arc (0-from-16). Another curious statistic is the number of offensive rebounds picked up by Canada. They had 19 while France picked up just 9. However the most interesting analysis of the match came from Canada's Head Coach Allison McNeill who said “We just didn’t put the ball in the hoop”. Pierre Vincent, the French, coach joked about the early schedule because he wanted to start the day at 6. But his technical staff preferred 6:15. He then expressed his satisfaction about the victory and his concern at times about his players' organisation when it came to rebounding. He said the Canadians were no static players. They would not stand still which made it sometimes hard to pick them up. However there were times when his own players just did not concentrate and were too slow to react. Vincent is generally pleased with the progress as he did not want to finish 4th at the end of the first phase. 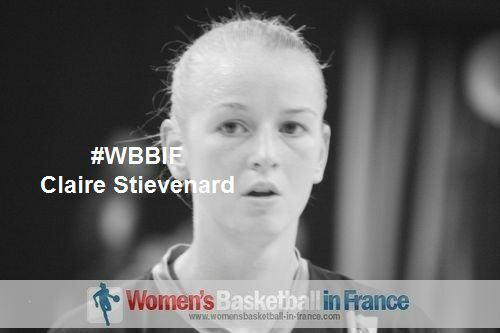 Womensbasketball-in-france' thoughts: The French team is slowly becoming a well oiled machine with players transparently exchanging roles. The basketball displayed so far has not been spectacular but at crucial moments the players have come up with plays and finishes expected of top international players. Against Brazil and Canada they have done what was necessary to win the game. Against Australia they gave a little insight of their full potential. They now need to finish the remaining group games and work on their weaknesses so that they will be ready for who ever they meet in the quarter-final. The first few minutes of the game were not very good to watch as both sets of players still looked sleepy. Despite the early turnovers France led (8-4) after three minutes. Emilie Gomis (in picture) was one of the first players to find her rhythm and soon France were leading (11-4). However once Pierre Vincent started his rotations, things started to go wrong and Canada were right back into the match with back to back scores from Shona Thorburn and Natalie Achonwa. The Canadians started to win the offensive rebounds and the two teams started to scrape around for the loose balls. Canada's finishing was poor with France edging the first quarter (13-12). France finally got rolling at the start of the second quarter quickly pushed their advantage (23-16) but Canada continued to be aggressive and with Shona Thorburn driving the attack Canada were soon back o,n the tail of France (21-23). Pierre Vincent called a time-out with 16 minutes played but nothing changed for France because Canada picked up offensive rebound after offensive rebound. 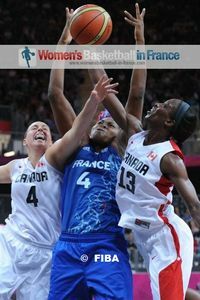 France went into the locker room leading (28-25) after a Sandrine Gruda put-back on the buzzer. The start of the third quarter was almost a copy of the second quarter with France controlling the first five minutes while staying in front (38-33). Canada continued to battle away under the boards and trailed by just 2 points going into the final quarter (40-42). 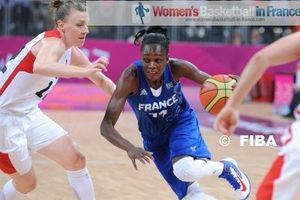 At the start of the final quarter Isabelle Yacoubou-Dehoui hit 8 points in a row for once again France being back in control (50-43). Yet Canada did not panic and slowly worked their way back into the game despite France hitting free throw after free throw. With about 12 seconds to play Thorburn was fouled while attempting a three-pointer with her side trailing (55-62). She hit the first two freethrows and missed the third. But Achonwa picked up the offensive rebound, scored and was also fouled. Achonwa calmly hit her free throws. So with 10 seconds to play France's advantage was down to 2 points. 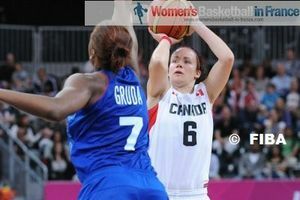 The Canadians had no choice but to foul Céline Dumerc with 9.6 seconds to play. 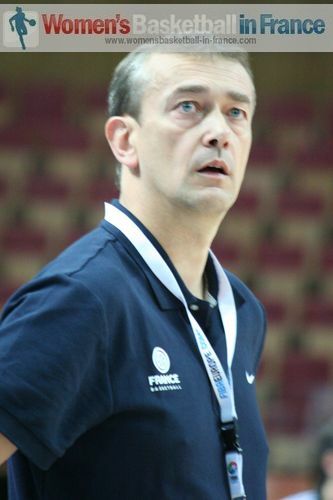 Dumerc hit the free throws and France escaped with a victory. The official attendance at the London Olympic Basketball tournament for the women's games has so far beaten all the recent preliminary rounds of FIBA sanctioned events. With Australia beating Brazil (67-61) and Russia defeating Great Britain (67-61) in Group B, it is now official that France and Russia have booked their tickets to the quarter-final of the London Olympic Basketball Tournament. In Group A China keep on winning, they beat Angola (76-52) while the Czech Republic have just beaten Croatia (98-70) for their first win. The USA beat Turkey (89-58) and have also qualified for the quarter-final.